The Scorpions of Zahir by Christine Brodien-Jones. Review: Do you love stories about desert adventurers and huge animals? Well if you do then you should read The Scorpions of Zahir. The characters are Zagora, Duncan, Razziq, Mina, and Dr.Pym. Zagora and her brother and embark on an adventure in the desert where Dr.Pym receives a letter from a lady named Olivia she tells him she is Pitblade's cousin. Olivia tells Dr.Pym that she needs help to find the long lost Oryx Stone. Intrigued by this quest, Dr.Pym takes his kids Zagora and Duncan to Morocco to help find the Oryx Stone. When they got there, Zagora finds the stone in a trunk in the attic, but she doesn't tell anyone. She has the stone the whole time and once they meet Olivia for dinner, Zagora finds out that Olivia is very mean. So Zagora decides to put a scorpion that she found on a stamp into Olivia's drink. When the scorpion touches the water it grows incredibly large. It doesn't take very long for Zagora to realize the evil lies within the scorpions and Olivia's evil plan. Can Zagora stop her in time? You'll have to read to find out! I enjoyed The scorpions of Zahir in some parts more than others. Some of the book is filled with amazing details and awesome adventures, however, in other parts the story became boring, especially when the characters are just talking and not doing anything fun. 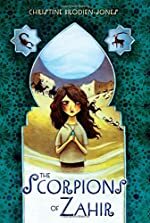 I would recommend The Scorpions of Zahir for fourth graders or higher because there are a few higher-level vocabulary that might be challenging to younger readers. I think if someone wants to be an adventurer when they grow up, this book is perfect for them. The characters seem so real in this story because this could happen to anyone young or old. I love the part when Zagora finds he dad after looking for him non-stop. This story is heartwarming and makes you want to tear up sometimes. This story took me awhile to read because at times I lost interest. It may not be boring to other people. The adventure combined with mystery, suspense, heart-warming messages, and a few scary moments make The Scorpions of Zahir a worthy book to read. We would like to thank Random House for providing a copy of The Scorpions of Zahir for this review. Have you read The Scorpions of Zahir? How would you rate it?